Counties: Organized local governments established to provide general government services; includes those governments designed as counties, parishes in Louisiana, and boroughs in Alaska. Townships: Organized subcounty local governments established to provide general government services for areas defined without regard to population concentration; includes those governments designated as towns in the six New England states, Minnesota, New York, and Wisconsin and townships in other states. Census 2020 uses boundaries as they are on January 1, 2020 to publish the results. The Census Bureau depends on local and state governments to update and correct the boundaries of these areas. It is important to have correct boundaries, not only for the Decennial Census, but also for other programs that publish data for these areas, like the Economic Census, the American Community Survey and the Population Estimates. 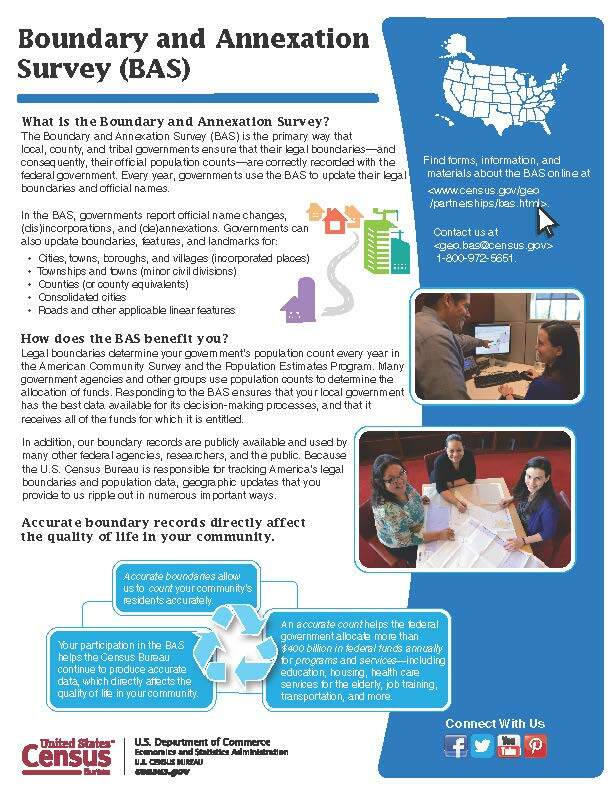 The U.S. Census Bureau conducts the Boundary and Annexation Survey (BAS) annually to collect information about selected legally defined geographic areas. The BAS is used to update information about the legal boundaries and names of all governmental units in the United States. The Census Bureau is emailing annual response information to all federally recognized American Indian tribes with reservations or off-reservation trust land, governmental counties (and equivalent areas), incorporated places, consolidated cities, and governmental Minor Civil Divisions (MCDs). More information on BAS can be found at the Census Bureau BAS page. This include information on time schedules, links to current maps and shapefiles and information on consolidating submissions. BVP is conducted in 2020 and provides the highest elected or appointed official (HEO) of a local government or tribal chair of a tribal government a last opportunity to review and comment on the boundary of their entity and any address range breaks at the boundary before the tabulation of the 2020 Census data.